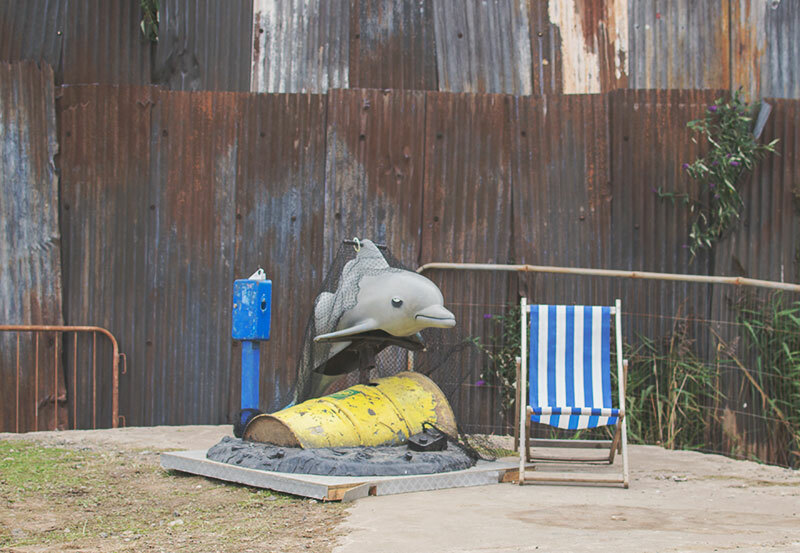 Ever since hearing about Dismaland I have been desperate to go, especially as we live less than an hour away. When tickets went on sale last week I spent 40 minutes refreshing the screen and eventually got through so on the way back from Wales on Wednesday we stopped off and headed down to the old Tropicana building on the sea front in Weston Super-Mare or Weston Super-Nightmare as I prefer to call it, no offence to anyone who lives there but I’m not a huge fan of the overcrowded pier and brown sludgy ‘sea’. Tropicana was an outdoor lido that shut down 15 years ago. 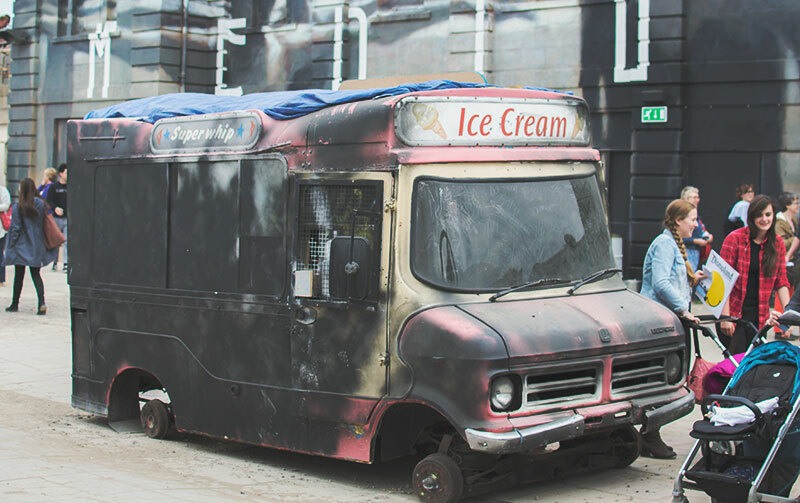 It was a dismal and eerie looking place beforehand so I can see why Banksy chose it, it made the perfect setting. Mr C used to go there when he was little so it was really interesting for him to go back in there. Initially we were going to try and go without the kids due to the ‘some images unsuitable for young children’ warning but it was down to parents to decide and after reading lots of reviews and looking at the images other people were sharing we decided we would take them and just not take them into the main castle where the upturned princess carriage was situated. This was definitely the right decision as they had a great time and it would have been a shame not to take them. We took it in turns to go in and see the princess carriage as I do feel like that would have been a bit much for Cherry, I just don’t think she would have understood why there was a princess hanging out of it. The only other bit we averted her eyes to was the Grim Reaper going round on a dodgem, that was also inside a big building so easy to avoid, she might have found it funny but we couldn’t decide so thought it was best not to take the risk! 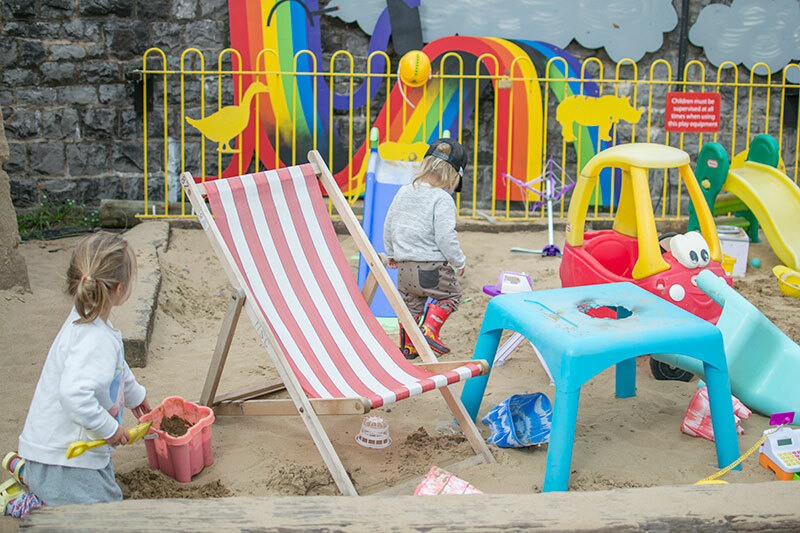 The main area itself had all kinds of weird and wonderful things to look at as well as a big sand pit full of toys (clearly Banksy has no idea about making things dismal for kids!!) so they loved looking at it all. There was a huge art gallery section which I had no idea was there, I had seen so many photos but they all seemed to be of the same things. Then there is another large room with a huge city disaster scene set up with lots of tiny flashing police cars and riot vans. Again I had no idea about this part. Then you head out to the main area which as you will see is just packed full of surreal things to look at. There is also a ferris wheel, carousel and various fair games like hook a duck, all with a twist of course. They play the same music through the speakers repeatedly (it’s a classic kind of beach tune but no idea what it’s called! ), occasionally there will be an interlude for a weird message. They have a little cinema with deckchairs to sit and watch the weird short films that were playing. I wasn’t actually expecting to find places to eat in there but there was a big pizza place too as well as a few bars dotted around. They have been having events there on Friday nights, both live music and tonight there is a comedy show. We both said how amazing it would be to go to an event there. It also opens in the evening and you can go when the whole place is lit up, it looks amazing at night. If you look on Youtube there are some videos of it. These puppets were my favourite part, there is a member of staff on the floor above making them dance to music. This lorry structure was a big hit with Tiger, there was also a spinning caravan that you could have a go in for £2. I’m not sure what was in it! 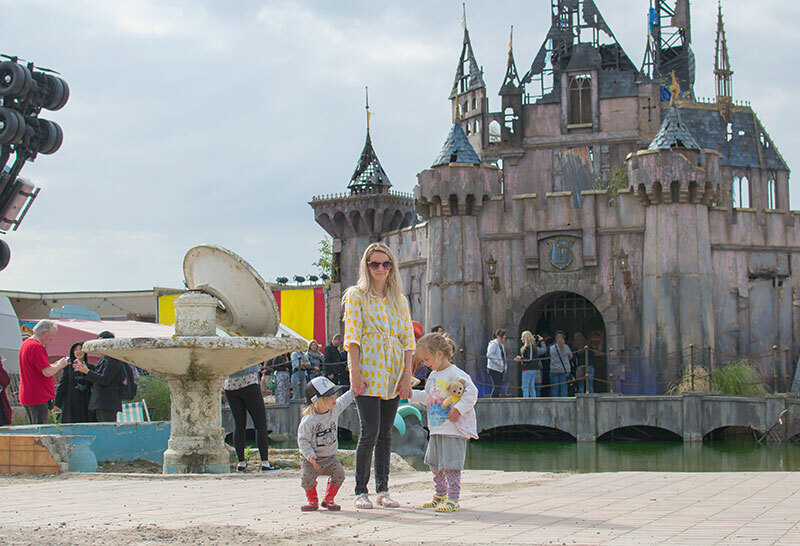 I absolutely loved it, I love anything that is a bit different and this is so much more our kind of thing than the traditional Disneyland. The only thing that would have made it better was it not being quite so busy but given that it’s only on for a month I was able to embrace the crowds. I’m so glad I managed to get tickets, in fact I’m actually planning to go back again with a couple of friends if we manage to get tickets next week. The staff were all miserable and unhelpful and I can’t help thinking it would have been a perfect place for me to work as a teenager, I used to serve people with exactly the same attitude only I wasn’t supposed to be doing it! When you leave after walking past all the merchandise available to buy the staff tell you they hoped you had a horrible time. We didn’t though, it was too bizarre to be dismal. I should probably note that for some reason we didn’t stumble upon any of the exhibits that deal with the more serious side of things and I didn’t see the refugee boats so I think they might have been taken down given what has happened recently, although I can’t find anything about it online. We walked past where it was though and didn’t notice it so pretty sure it can’t still be there. 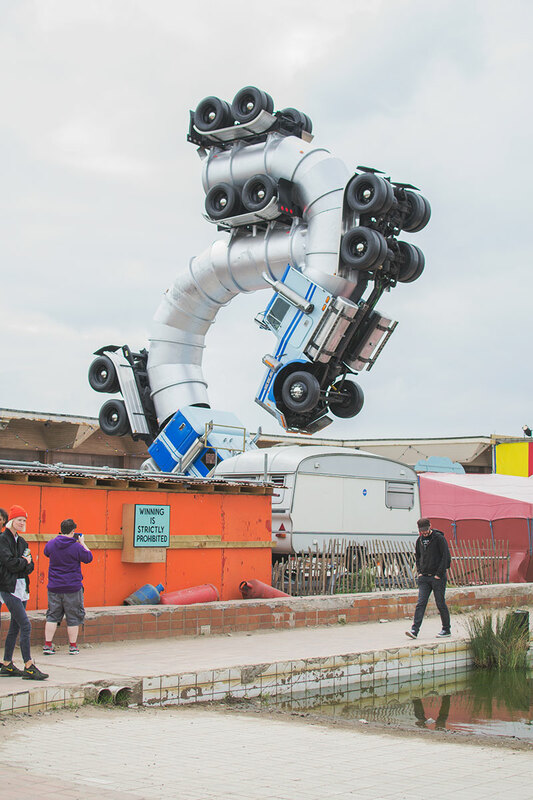 If you want to find out more then you can read all about it on the Dismaland website, there is an interview with Banksy which is worth a read and if you live anywhere near it then try and get tickets. It’s a once in a lifetime opportunity and even if you hate it at least you can tell people you’ve been!